No deal emerged on Wednesday from a White House meeting between President Trump and the congressional leadership of both parties, with the president saying there is no end in sight to the partial government shutdown. Democrats pitched at the meeting reopening government by funding nearly all the shuttered agencies with full-year appropriations and kicking the can on Homeland Security Department spending to give more time for border negotiations. House Democrats are poised to vote on two measures to accomplish that on Thursday after new members of the 116th Congress are sworn into office. Democrats noted the bills they will consider previously won bipartisan approval in the Senate. “Our question to the president and the Republicans is why don’t you accept what you have already done to open up government and enable us to have 30 days to negotiate over border security,” House Speaker-designate Nancy Pelosi, D-Calif., said after the meeting. Trump has rejected that proposal, however, as it does not provide the $5 billion he requested for fiscal 2019 for his proposed wall along the U.S.-Mexico border. 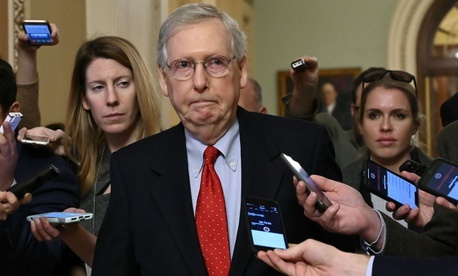 Senate Majority Leader Mitch McConnell, R-Ky., reiterated on Wednesday he would not bring up any bills in the chamber until Trump signals his support for them. “I don’t think any particular progress was made today,” McConnell said, adding he was hopeful all sides could reach an agreement in the “coming days or weeks.” Trump asked congressional leaders to return to the White House on Friday. Prior to the congressional confab in the White House Situation Room, Trump held a Cabinet meeting in which he suggested he was willing to negotiate but said any deal would require significant concessions from Democrats. Several members of the Cabinet spoke at the meeting, but did not address any pains their employees may be feeling from furloughs or their pending missed paychecks. Instead, they praised the president for standing resolute in his demand for wall funding. Trump noted the meeting was set up as a briefing from DHS officials to “tell Chuck and Nancy” about the situation at the border, “how dangerous it is and how we need a wall.” After the briefing, House Minority Leader-designate Kevin McCarthy, R-Calif., said Democrats were uninterested in what DHS Secretary Kirstjen Nielsen had to say and quickly interrupted her to challenge the points she made. Senate Minority Leader Chuck Schumer, D-N.Y., accused Trump of equivocating when he asked for “one good reason” why the non-DHS agencies should remain shuttered as border negotiations continue. The House on Thursday will vote on a consolidated package of bipartisan bills that came out of the Republican-controlled Senate Appropriations Committee to provide full fiscal 2019 funding for the departments of Transportation, Housing and Urban Development, State, Interior, Agriculture, Treasury, Commerce and Justice, as well as a number of independent agencies such as the Environmental Protection Agency, Office of Personnel Management and General Services Administration. That bill would include a 1.9 percent pay raise for federal workers in 2019. The House is also expected to pass stopgap funding through Feb. 8 for DHS. A continuing resolution at DHS would continue the fiscal 2018 appropriation level of $1.3 billion for new border security measures. More than 345,000 federal employees are currently on furlough without a guarantee of back pay, while an additional 500,000 are working but facing delayed paychecks.